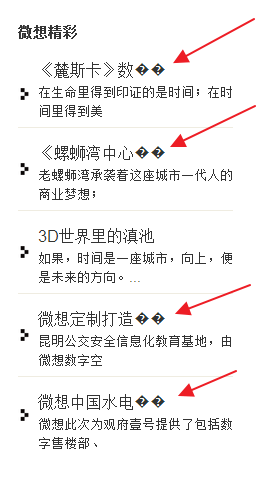 The module title is "微想精彩". You can see that when truncating the description text, there is two un-readable strnage symbols (like ? but not really a question mark) at the point of cutting off text. It seems that this module can not handle Chinese characers properly. Could you please improve it to support Chinese language ? Did you used mb_substr() instead of substr() for that truncating feature? Did you get it solved? I see the title is fine now. Yes, I did a replacement: replace ALL "substr" with "mb_substr" in all files (not only php files, but all files) of that module, now it can truncate Chinese characters properly. I hope you improve your module with this same method. Otherwise, next time I upgrade this module the problem will come back again. Thank you for your report! It’s much appreciated.